Terence Fixmer’s path through the changing techno landscape of the past 20 years has been anything but direct. Indeed, the French born producer, musician and Planete Rouge label founder has long been influenced by the periphery of continental European dance music subgenres from electronic body music, new beat and acid, before combining them into his own pioneering hybrid of futuristic, EBM-inflected techno with classic releases such as 2001’s Muscle Machine or the collaborative Between The Devil LP with Nitzer Ebb’s Douglas McCarthy as Fixmer/McCarthy. While the sound in recent years has been rediscovered and recast in diverse contexts by a new generation of producers, Through The Cortex sees Fixmer gravitating toward a different kind of industrial-tinged electronics, led as much (or more) by analogue sequencers, melodies and ultra-saturated sounds of synthesizers than drums and percussion. Across eight tracks at a compact but varied 40 minutes, the LP touches on an aesthetic hinted at in recent Ostgut Ton releases (2016’s Beneath The Skin EP and 2017’s Force EP), revealing a sonic narrative through noisy, screaming synth/vocal riffs with a jagged, guitar- like post-punk sensibility. Through The Cortex is techno with a voice – or rather multiple voices – guiding listeners through hypnotic, space- and social-themed terrain as a kind of dark soundtrack to darker days. The result ranges from the slow John Carpenter-inspired Escape From Precinct 13 funk of “Expedition” and the patient yet muscular stomp of “Fury” to the mesmerizing Suicide-like pop of single “Accelerate”, where Fixmer, using his voice as an instrument, chants the track’s ambiguous title in an invocation of systemic change/collapse. Elsewhere, the story is told with more abstract and wailing vocals like on “Shout in A Black Hole”, or in the warm, entrancing chords floating across the stereo image in ostensibly changing time-signatures on “A Halo Somewhere” – the LP’s uncharacteristically kosmische musik come-down. 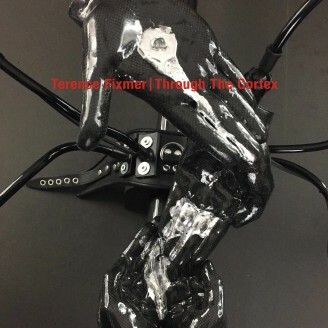 The track, and Through The Cortex as a whole, reflect what can be described as Fixmer’s idiosyncratic take on both techno subgenres as well as the larger pool of electronic music in general. This broad approach translates into a sound that is not only difficult to pin down, but also one that lends itself to multiple listens.